This is a new image taken two weeks ago in the Sand Wash Basin Herd Area in Colorado. The wild stallion Brave is in the foreground, and his mare Flirt and filly Amoré are further back, with a dramatic sky. 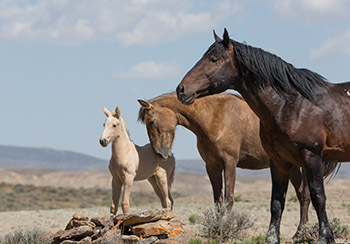 The concept of family is extremely important for wild horses, and this image illustrates the body between them. This bold black and white images is of four Comptois mares running in southern France. 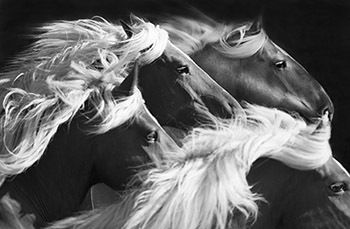 The lightness of the manes against the dark background emphasizes the sense of movement in this image.